The application module Heat Treatment helps you simulate heat treatment processes and predict material properties. With the Heat Treatment module, Simufact Forming gives you a unique option for the simulation of heat treatment processes that allows you to define the necessary parameters easily and quickly. Flexible times, temperatures, and heat transition coefficients can be defined, and even combined, for both global and local heating and cooling processes. 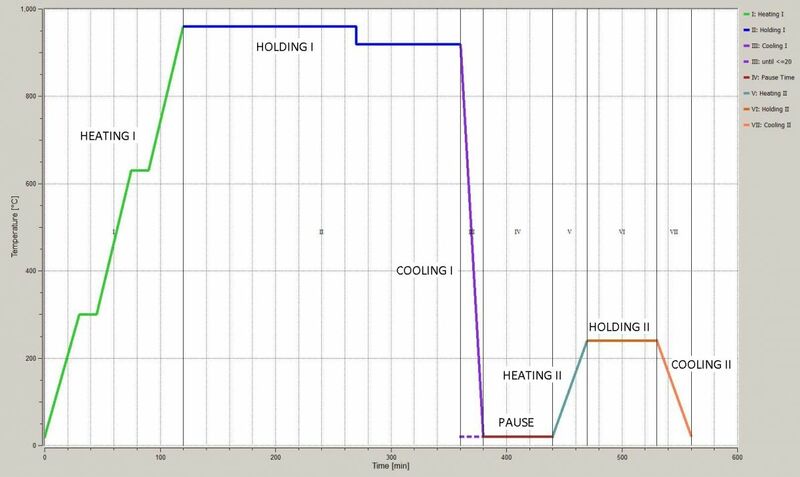 An entire heat treatment cycle, consisting of heating, holding, transporting, cooling, pausing, reheating, holding, transporting, and cooling, can easily be simulated as one continuous process. The material parameters necessary for the calculations can be generated with programs from our partners Sente Software (JMatPro®) and GMT (MatILDa). Example material data is included in the module. 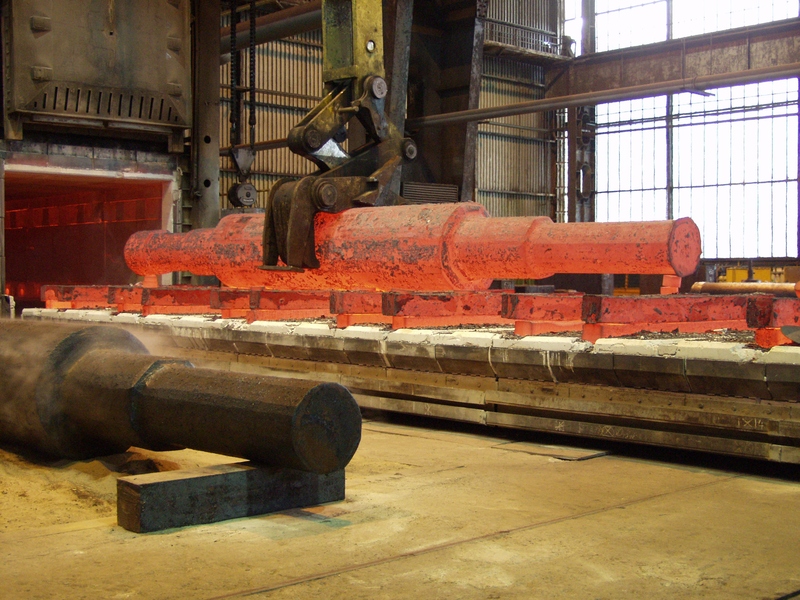 The Simufact Forming Heat Treatment module expands the material model by including the effects of cooling or quenching typically found inheattreatable steels. A simplified approach uses information from the continuous cooling diagram. 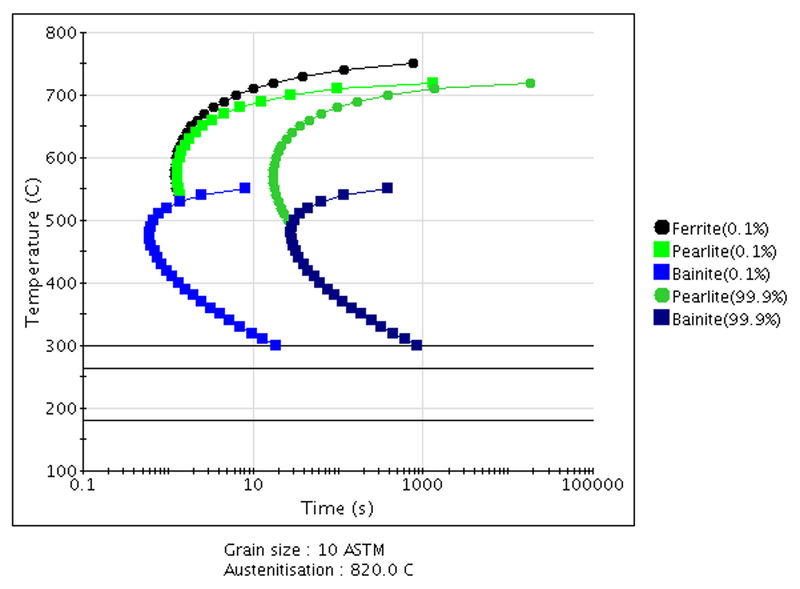 Based on the temperature-time evolution, this approach allows you to estimate the expected mechanical properties (e.g. hardness) and phase fractions (ferrite, perlite, bainite, martensite, austenite). This fully-integrated approach, based on the isothermal TTT diagram, takes into account the additional strain components that occur due to phase transitions. This makes it possible to predict not only the phase fractions, but also heat treatment related stresses (e.g. risk of quench cracks) and distortions. The additonal strains of diffusion-controlled transformation processes (formation of ferrite, perlite, and bainite) are calculated based on the Johnson-Mehl-Avrami-Kolmogorov (JMAK) approach. Calculation of the diffusion-free formation of martensite is based on the Koistinen-Marburg equation. Correctly calculating the time-temperature history is of the utmost importance when simulating heat treatment processes in order to gain a quality prediction. The calculation is mainly influenced by the heat transfer coefficients between the component and its environment. It is usually necessary to define the coefficients depending on temperature because of the physical processes that occur on the surface of the component during the quenching phase. However, simulating the process allows you to apply different coefficients to one component (for example, time-dependency). To find out the specific heat transfer coefficients for the equipment and procedures being used and how they will develop, Simufact.forming offers you functions that allow for an automatic fit of measured curves and calculated results. This makes it possible to identify and optimize parameters automatically. Did you know: The effects of heat treatment, such as recrystallization and solution annealing between the different forming stages, can be quickly and easily included in the simulation without switching to Simufact.forming Heat Treatment. For example, the decrease in strain hardening within a cold forming process chain by annealing can be considered by Simufact Forming directly. Due to its easy and practical controls, Simufact Forming Heat Treatment is especially suitable for hardening plants that handle a broad spectrum of different components. The calculation of every single process step, from the raw materials to the final product and the final stress test, is becoming more and more important. It goes without saying that the simulation of heat treatment can be coupled with those of forming and welding, so that the entire process chain for component manufacturing can be simulated from start to finish. The calculated local properties of each component and the real distortions in the assembled components can be applied to durability or structural analysis, for example with MSC’s Marc software.